CREATIVE DOCUMENTARY. NOW AND THEN. The Fifteenth Documentary Film Symposium held in Riga on September 6 - 11, 2003 has finished its work proving to be a successful event. The symposium gathered 25 delegates from 11 European countries and many Latvian representatives including students of the Academy of Culture and the University of Latvia, professionals and those interested in documentary cinema. During three days of screenings 49 documentaries from 13 countries were shown in the cinema "Riga", while after screenings debates were held where the participants and spectators could advance their thoughts and exchange views on the films. The discussions were positively appreciated as the film directors could hear the opinions of their counterparts and experts from different counties. The film programme consisted of two parts: the retro films (1960s-1980s) selection from each participating country was combined with the recent (2001-2003) documentaries. 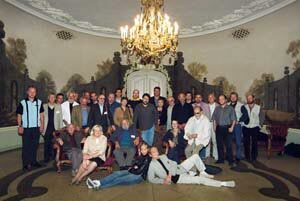 The participants of the symposium also represented different generations of filmmakers and film theoreticians. The symposium was very well attended, the hall of the cinema "Riga" (250 seats) was full. The opportunity was used by many participants and guests of the Symposium as well as by representatives of mass media. The theoretical part of the symposium was held on September 10 in a conference hall of the hotel "Reval Latvia". During it one could listen to 9 speakers reading out their reports and take part in the Round Table the session of which was filmed. Information provider: EDKSGILDE. Information provider is responsible for the contents of published materials.